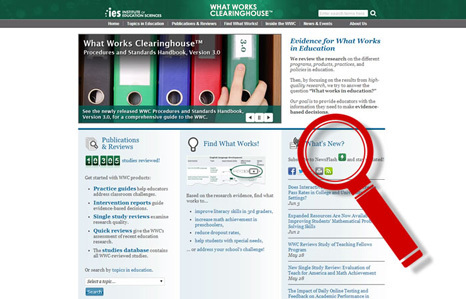 The WWC has many resources for early childhood educators and researchers. We’ve reviewed more than 25 interventions in the early childhood area, over 15 of which showed positive effects. We also have numerous resources for those wishing to conduct their own studies of effectiveness. Learn about our systematic review process and the procedures we use to assess the quality of the evidence with the WWC Handbook. Explore our review protocols for Early Childhood Education and Early Childhood Education for Children with Disabilities. Learn more about our areas of focus and key definitions. Find early childhood education-related studies: The Registry of Randomized Controlled Trials (RCTs) is an online database of completed and in-progress RCTs in education. This resource is designed to help schools, school districts, and educational program developers identify research regarding the effectiveness of educational interventions. Get tips for describing studies and reporting findings: Our Reporting Guide for Study Authors (279 KB) provides guidance about how to describe studies and report their findings in a way that is clear, complete, and transparent. Learn why it’s important to have standards for research. Return to the main page to learn more about finding evidence-based strategies, programs, and practices to start preschoolers on the journey to academic success.